I didn’t realize the wind and the chatter of another nearby bird would drown out his hammering in this video – but you can certainly see how industrious the Pileated Woodpecker is!! This entry was posted in Birds, Marsh/Wetlands and tagged Pileated Woodpecker. Bookmark the permalink. Thanks BJ for anothert interesting post, since we do not have these birds it is a bonus for me. Do these birds actually affect the tree in any adverse way? Do they actually make holes in the tree, like the one in the movie above its head? Are these nesting sites, or just hideholes? I’m happy to hear this was a new bird and interesting for you, AB. What great questions! 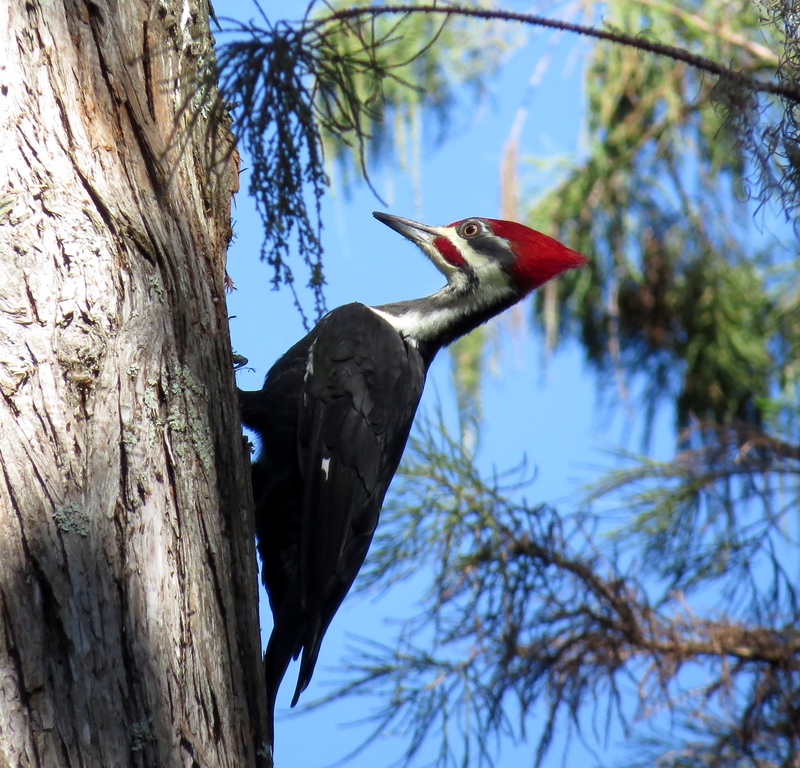 Pileated Woodpeckers mainly eat carpenter ants, termites, or other insects, and they carve out large, rectangular holes in trees to find these insects, and to create nesting sites. The holes are often used for shelter and nesting by other animals and birds later. They sometimes use dead or near-dead trees, where damage is not as problematic. Wow – what a handsome bird! Yes, Kathy, I agree – they are large and very handsome with their strong, chisel-like beak, black and white stripes, and striking red head feathers. I love Pileated Woodpeckers and enjoyed your photo and the video. The hammering of these birds is almost deafening–it reminds me of the sound of a jackhammer breaking up concrete. Most of the time, I hear the Pileateds and they fly away before I am actually able to get a clear glimpse of them. I keep my eyes and ears open whenever I am in the woods, but haven’t seen or heard one in quite a few months. Oh yes…I forgot to mention the very distinctive call that Pileated Woodpeckers make. This guy actually did fly off right after the first time I saw him, but luckily he returned to the same spot so I could get a few shots of him. How fortunate for you to have a pileated woodpecker so close by every day! I have found them difficult to capture in the past, except when they are so busy pounding away at a tree – they stay in one place for a while! This woodpecker was quite a ways up a tree in the woods, and I had a good view for several minutes. Wonderful picture and video too of this beautiful woodpecker. I have not seen (or heard) one around here so it was real treat!! That’s interesting, Tiny – maybe the Gulf Coast doesn’t have as many wooded areas as we do here in Palm Beach County? We have quite a bit of wooded areas, including in the park close to home, but I’ve only seen Red-bellied Woodpeckers there. I love woodpeckers but have never seen a Pileated (they don’t live here), thanks for sharing your picture and video! Very nice. It’s interesting to learn that Pileated Woodpeckers are quite common in some places and virtually unknown in others! Thanks for your visit – have a great week! gorgeous shot of this guy! I have never been fortunate enough to photograph a Pileated Woodpecker. Thanks a million W. H.! They are so large and so powerful – really beautiful.